Whew! Sorry so late today. This trying-to-do-my-job-while-all-the-kids-are-at-home thing is not working out very well. Someone always needs something, dadgummit! It’s 3:38pm and the first time I’ve had a chance to sit down all day. Anyhoo…We have a new gelato shop in town, Pacuigo, and our family is singlehandedly keeping it in business. ($3.50 for a teeny, tiny kid-size scoop…eek!) 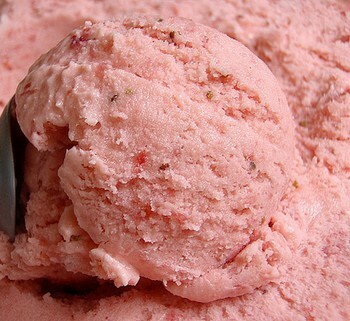 In the interest of preserving our nest egg and in warding off our 90-degree temps, I figured out how to create our favorite summer gelato flavor – strawberry. This is silky, silky smooth (and I don’t even bother straining it before freezing). Use the ripest, yummiest strawberries you can find and don’t forget the splash of lemon! Combine sugar and cornstarch in medium saucepan. Whisk in milk and cream and place over medium heat until mixture thickens and begins to bubble, about 5 minutes. Pour into a bowl; place bowl over ice to cool. Stir mixture occasionally. Puree strawberries in a blender or food processor. Fold pureed mixture into cooled gelato base and stir in lemon juice. Refrigerate 3 hours (up to overnight). Freeze in an electric ice-cream maker according to manufacturer’s instructions (about 20 minutes for mine). Transfer to a covered container and freeze until desired firmness.